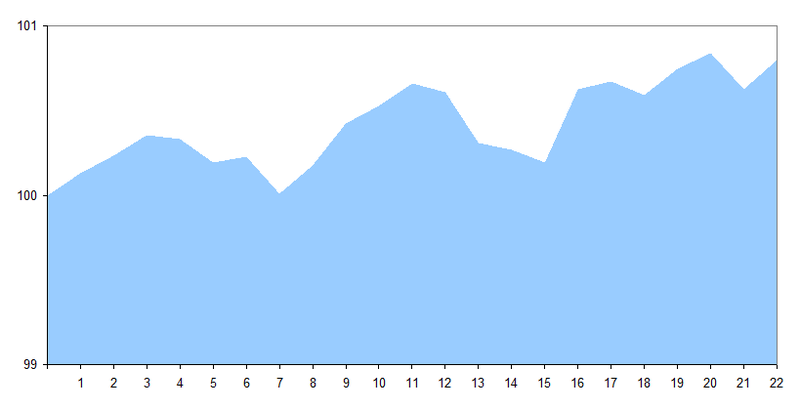 The following chart plots the average performance of the FTSE 100 Index during December since 1984 (more info on this type of chart). As can be seen, historically the market has traded fairly flat for the first two weeks of December and then risen very strongly in the second half of the month. 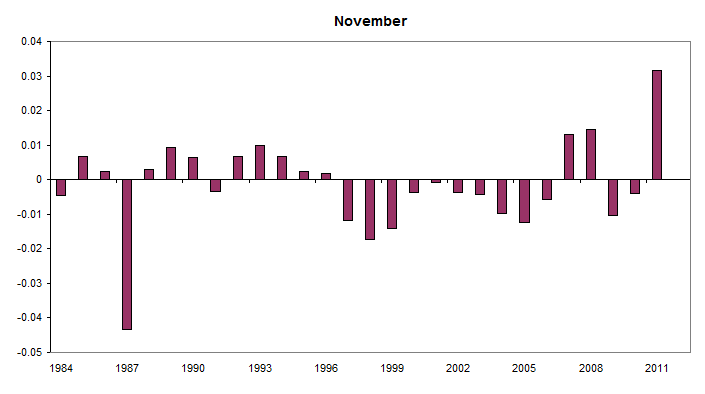 The following chart shows the average performance of the market in November (1984-2012) and overlays the actual performance in November 2013. Tomorrow will be the last trading day (LTD) of November. As explained in the 2014 edition of the Almanac the LTDs of months used to be stronger than average, but in recent years they have been weak. This is quite different from the first trading days of months which strongly out-perform the average for all days, and where the effect has strengthened in recent years. Since 1984 the market has on average fallen 0.12% on the LTD of November, with positive returns in just 45% of all years, which makes the November LTD one of the three weakest month LTDs in the year. 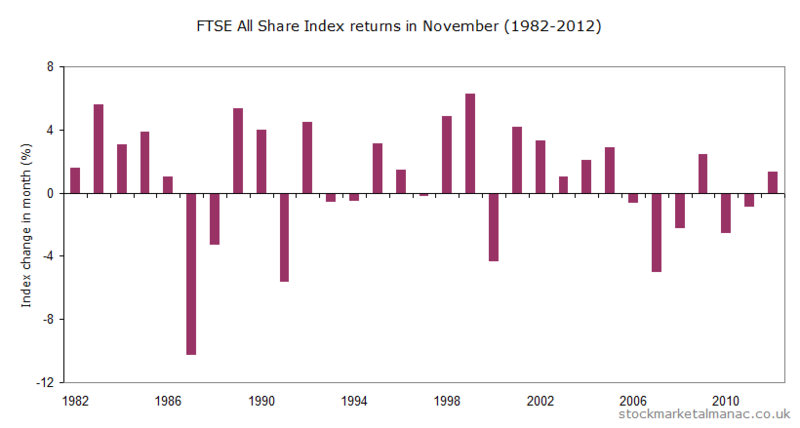 The following chart shows the FTSE 100 Index returns for every November LTD since 1984. 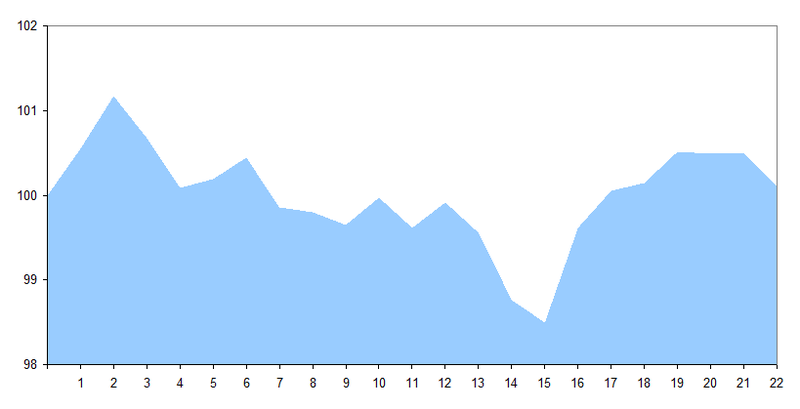 The following chart plots the average performance of the FTSE 100 Index during November since 1984 (more info on this type of chart). As can be seen, historically the market has increased, with a few ups and downs, throughout November, ending the month at the month high. The following chart shows the average performance of the market in October (1984-2012) and overlays the actual performance in October 2013. The table below lists the sectors that have historically out-performed the market in November. The following table lists the sectors that have been weak in November. Since 1984 the FTSE 100 Index has risen in 59% of years in November, with an average return over the period of 0.7%. This gives it a rank of 6th place for monthly performance. Although this performance is only average, the significant feature of November is that it marks the start of the six-month strong half of the year (November to April). In other words, investors should be increasing exposure to the market this month (if they haven’t already done so in October). The accompanying chart plots the percentage performance of the FTSE All Share Index for each November since 1982. For example, last year in 2012 the market rose 1.4% in November. On average the market tends to rise the first three days of the month, then to given up those gains over the following few days, rise again and fall back, until finally increasing quite strongly over the final seven trading days of the month. It could be noted in passing that November holds the record for the greatest ever one-day increase in the FTSE 100 Index: on 24 November 2008 the index rose 9.8%! In the last twenty years the sectors that have been strong in November have been: Beverages, Electronic & Electrical Equipment, Fixed Line Telecommunications, Food Producers, Life Insurance, Media, Mining, Technology Hardware & Equipment and Travel & Leisure. While the weak sectors have been: Aerospace & Defense, Banks, General Industrials, Oil & Gas Producers and Real Estate Investment Trusts. For stocks, the following companies have performed well in November over the last ten years: Babcock International Group, Compass Group, Premier Farnell, Shire and Tate & Lyle. The shares that don’t seem to like November are: AstraZeneca, Greggs, Herald Investment Trust, Rentokil Initial and Tullett Prebon. An interesting strategy to consider in November is to pairs trade Shell and Exxon. Since 2000 Shell shares have out-performed those of Exxon (priced in sterling) in November by an average 3.7 percentage points. The strategy would be to go long of Shell and short of Exxon the end of October and close the positions the end of November. November is the third busiest month for interim results analysis: 62 companies from the FTSE 350 make their announcements this month. The only significant economics date this month is the MPC interest rate announcement on 6 November; and there will be a MSCI quarterly index review announcement on the 12th. Tomorrow will be the first trading day (FTD) of November. Since 1984, the FTSE 100 Index has risen on average 0.17% on the November FTD. The index has had a positive return on this day in 66% of years since 1984. 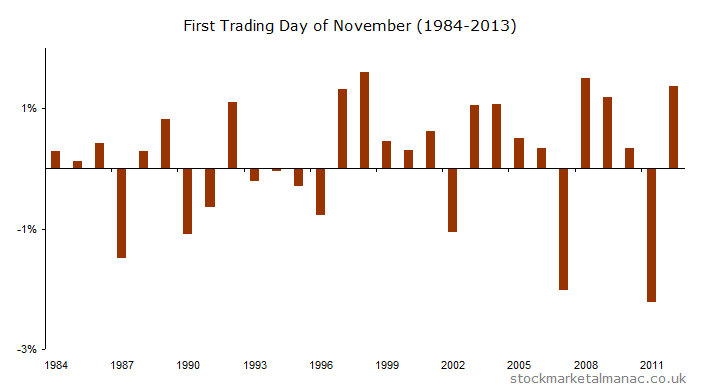 Since 2000, the performance has been a little stronger on the November FTD, with an average return of 0.23% on the day. 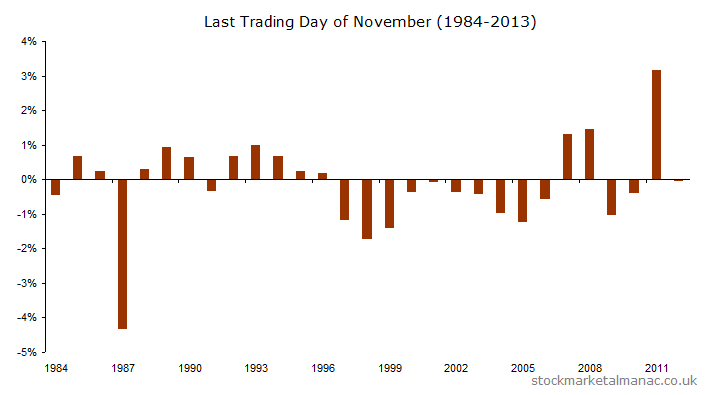 The following chart shows the returns for every November FTD since 1984. Tomorrow (Friday 30 Nov) will be the last trading day (LTD) of November. 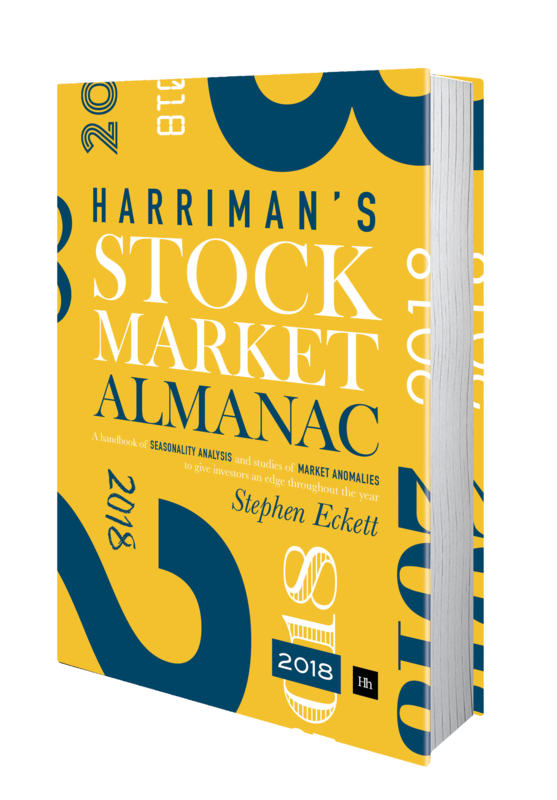 Since 1984 the November LTD has been the weakest of any month; and in the last 15 years the market has only risen three times on the November LTD.
As explained in the 2013 edition of the Almanac, historically UK market performance in November has been nothing special – it is 5th in the ranking of months. The chart shows that on average the UK market climbs steadily throughout the month. However, this year is a little special as we have the US presidential election in November.The elections always take place on the Tuesday after the first Monday in November; the earliest possible date is 2 November and the latest possible date is 8 November. This year the election is 6 November. The following chart plots the average performance of the UK market in November (as above), but only for the years in which there’s been a US presidential election. As can be seen, historically, early enthusiam in the first couple of days has given way to a sell-off until a rally in the final week of the month.